She is a talent from Segrate, who is opening her way to the American music business. Cristina Vaira, 30 years old, is living in Boston, Massachusetts, since three years, where she studied at the prestigious Berklee College of Music and, exactly last year, she graduated with the highest grades. Now she is getting out her way in the vast American musical territory, strong with a brand new project that will bring her to perform for the Italian Consul in Boston and many other eminent people on June 21st. With her boyfriend Alejandro Ramirez-Cisneros, from Mexico and well-known at Berklee, she started a band called”The Pillars”, whose the first single has been recently spread through the web and it will be performed at the Dante Alighieri Society in Cambridge. The cultural center will celebrate 100 years of activities in promoting the Italian culture and traditions in US, and for this occasion the V.P. of Cultural Affair, Luisa Marino, has invited us for a triumphant debut – said the singer- Among the audience there will be the Mayor of Boston, Martin Walsh, the Italian Consul Giuseppe Pastorelli and many other great personality of the cultural, educational and political fields in Boston. There will be Professor from Harvard, MIT and Berklee College of Music. It will be a true privilege for us to play in such an event and we can’t wait!”. 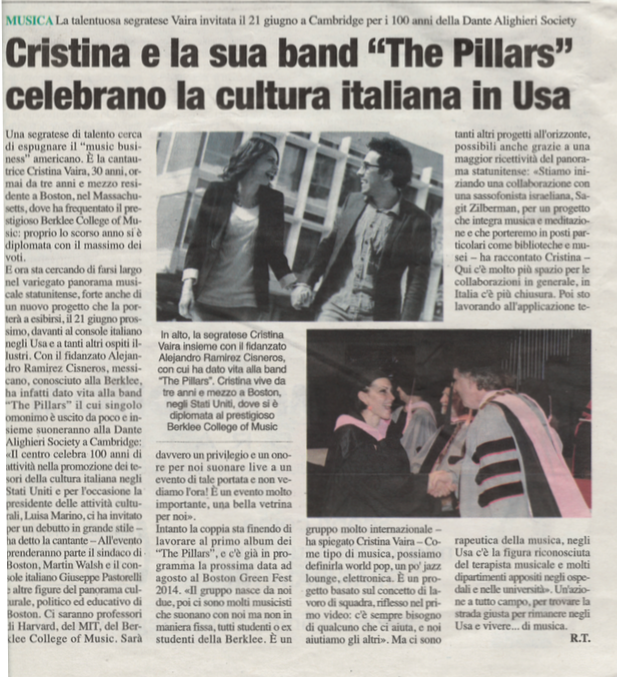 In the meantime the couple is working on the first album of The Pillars and in August they will perform at the great stage of the Boston GreeFest 2014. “The group has been created by us and then we collaborate with incredibly talented musicians from and outside Berklee. It’s a very international group – says Cristina Vaira – our music mixes different genres: World Pop, Jazz, Lounge, Electronica, Latin. It’s a project based on the strength of teamwork, as the first video shows: we always need someone’s help and support and that’s what we do”. There are also many other projects at her horizon thanks to the American open minded world: “We are beginning a project with the Israeli saxophone player Sagit Zilberman, which blends music and meditation and that we will bring in unusual venues like libraries, museums – told Cristina– Here there is more openness for creative collaborations, compared to Italy. I’m also exploring the therapeutic application of music, which in US is a recognized profession and there are specific Degree for that”. It’s a 360 degrees action on music, to develop a brilliant career in US.